Plenti+ Nursing Pillow + Toy Bar - Elle Love You is rated 4.8 out of 5 by 14. Rated 4 out of 5 by AnthonyV from Straightforward, multi-purpose pillow and toy We received this Plenti+ pillow & toy bar for our son. As I mentioned in the header, it's pretty straightforward in terms of how to use. Quality is good, it's lightweight, and it's easy to clean. My son seemed very interested at first, but his short attention span seemed to show as he got bored of it fairly quick in terms of "wanting" to use it for feeding and stimulation. That's the only reason I gave this 4 instead of 5, was that it didn't have a "WOW" factor. Rated 5 out of 5 by oneluv2704 from So cute!! I love this nursing pillow! It's easy to use and really soft and comfortable for baby. And the best part, this nursing pillow doubles as a play mat with the detachable toy bar! The design is super cute too and could be used for either a girl or a boy! Definitely would recommend!! Rated 5 out of 5 by Steponme from So useful! This multi purpose item is genius! First off it is beautiful and the pattern is very flattering. It offers great support when breastfeeding. Baby is never to high or to low, just the right positioning which is critical for long term breastfeeding success.The tab to remind you what side to feed on is so helpful, especially in those middle of the night feeding when you don't know what time it is or whats going on, it's fool proof. The toy bar is so cute and a brilliant addition. Using the pillow for tummy time or supporting sitting up is nice but to have a little extra toy for baby to grab at and look at is that extra something you didn't know you needed it until you had it. Really a great quality beautiful pillow and a must have for all new moms. Rated 4 out of 5 by Jen710 from Nursing Pillow I really liked this nursing pillow specifically because it had the activity rail. It gives the baby something to look at while they are eating or just relaxing. This is a great addition. Rated 5 out of 5 by NikMik from Great nursing pillow I’ve used other nursing pillows in the past, and they are a must have for any breastfeeding mother. They get baby and you in a more ergonomic position to provide support for both. I love that this was designed by a lactation consultant. 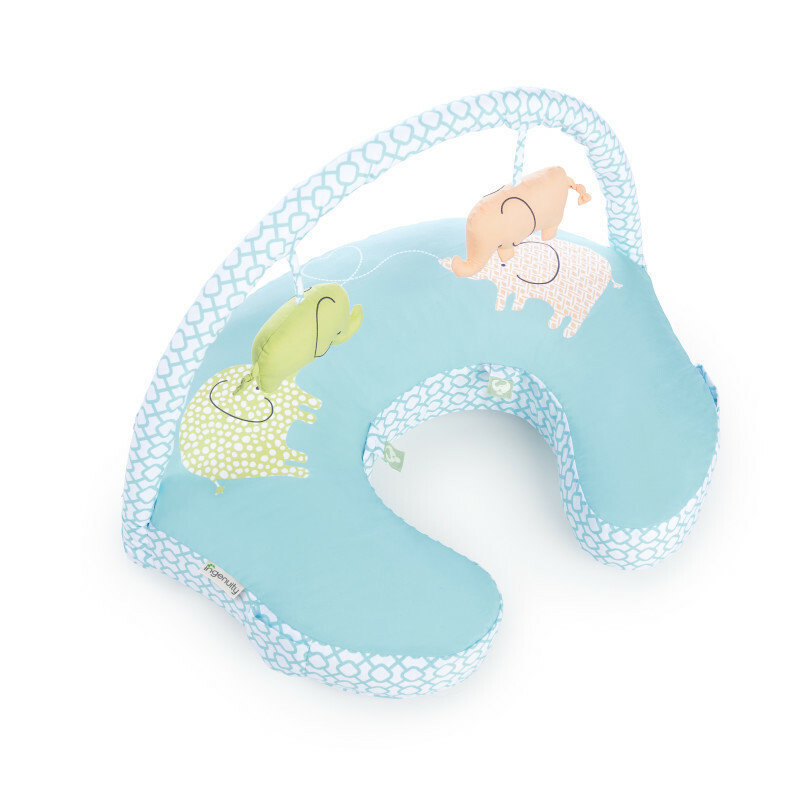 However, these nursing pillows are not exclusive to breastfed babies, as they offer many additional features. They offer ample support for tummy time and when baby starts to sit. The added toy bar is great and will keep baby busy. Rated 5 out of 5 by geewhizzzkris from Beautiful! This nursing pillow is da bomb! It is super cute. Very soft and cuddly. Baby lays there so comfortable. Likes to watch the lil animals dangling there while feeding. Rated 5 out of 5 by AnneS from My baby girl's new favorite place! The design is very simple, but versatile. I like that our infant can enjoy both tummy and back time, and that there are toys to keep her interested. The colors are soft and pleasant so they blend well with most decor. I would recommend this to any parent that's looking for a place to comfortably put their baby that's less expensive than a typical bouncer or swing.